The Case Foundation just released their 2013 Millennial Impact Report, a research project led by Achieve. I had the chance to speak with Jean Case, CEO of the Case Foundation, and she discussed the encouraging data this report reveals on the Millennial Generation. 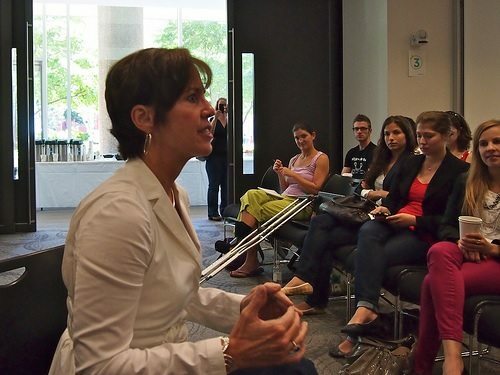 In a media world that often portrays millennials in a negative light as “technology obsessed” and uninterested in face-time, it was uplifting to speak with Jean and hear how millennials are becoming increasingly more connected to nonprofits and giving, as well as the great potential the nonprofit sector has to tap into this age group. Aine Creedon: Hi, Jean! It’s nice to meet you over the phone. Jean Case: And I’m delighted to talk to you, because I’ve been doing a series of interviews about Millennials. You’re the first Millennial I’ve had the chance to talk to about Millennials. AC: Thanks! I think this report is very interesting and full of great information for nonprofits. In looking at this new 2013 impact research, it looks like, in each of the last three years, you guys focused on a particular theme, but this year you brought all those themes together. JC: Yes, and one really important element to the study this year was in having some folks take a look at nonprofit sites and offer their perspectives. So, I think it will make for kind of an interesting, almost toolkit recommendation in terms of how nonprofits and causes can and do reach out to Millennials. AC: And this means that it is focused on technology? JC: Right, and I think it’s really encouraging that mobile is playing such a strong role here, because I think mobile represents a leveling of the playing field, in that you don’t have to have a computer necessarily to jump in and get engaged in a meaningful way. AC: But I also noticed that, on the volunteering side, a lot of the Millennial trends were encouraging more group volunteer opportunities. I was wondering if you thought, in any way, that that might take away from deeper volunteer connections or long-term volunteers. JC: You know, I don’t think it will take away from that. As I understand it, you were AmeriCorps, is that right? AC: Yes, I did two years of AmeriCorps. JC: Well, I think wherever you can build a strong sense of attachment—and one of those ways is through community—that’s where we’ve seen really strong retention of volunteers and volunteers having really positive experiences. I think about things like Habitat for Humanity and Special Olympics, which are truly models of volunteerism in the United States, and they’ve stayed strong even when different years showed a little dip in volunteerism. And, a lot of that is in group- or community-based volunteerism. So, I think it’s actually a great trend, and I think the work that we’ve been engaged in on so many fronts, we say is almost like virtually taking somebody by the hand and helping them get comfortable in a new environment. And we know one of the main reasons people don’t volunteer is because they simply weren’t asked. So, if Millennials are really natural networkers, I think they’ll bring a lot of friends and folks along that otherwise might sit on the sidelines. AC: What strategies surrounding volunteer recruitment would help Millennials feel like they’re making a tangible difference? JC: Millennials are a little bit different in that they’re much more focused on the cause and not the specific organization. From a strategy standpoint, I think—and we’re excited by this—it really should encourage collaboration, right? Because if you care about the cause, wouldn’t it be a beautiful thing if you had a bunch of organizations come together around these causes, so when volunteers come together, they can actually maximize the impact because it’s a collaborative effort, instead of just one organization that they’re helping? AC: I did see that. JC: Yeah, 75 percent of them, once they heard about a cause or an organization, spread the word by liking them on Facebook or retweeting them or telling their friends and associates about it. So, there’s a lot of really good viral stuff here, but it really is up to the causes and organizations to effectively deliver it to this generation. And I don’t know what your own experience has been, but obviously this is a generation that is really comfortable communicating in 140 characters or in a 6-second video, like Vine or Snapchatting. I think this idea of “quick, get to the point, show me where there’s impact, tell me what I need to do in an authentic way” is going to have the greatest appeal to this generation. AC: I agree. One thing that comes to mind is this whole idea of sharing content, and that everything is online with sharing social media. Do you think that there’s a little bit of a negative impact? Like, how do you get them past just the sharing to actually giving, working with an organization, or volunteering? JC: Well, if you look at the data, the data is pretty encouraging. I mean, 80 percent of them made a donation, 52 percent of them said they were interested in monthly giving, 70 percent of them volunteered. We thought this report was very consistent with what we see in the various campaigns we’ve been engaged in with Millennials and that is that it really is about engagement. It’s not about just a one-off talking about it, it’s not just about a one-off writing a check, but it’s about full-on wanting to feel part of the solution and part of the cause, and I really do believe social media uniquely enables that. So, like anything, I think all forms of new technology have a potential downside, but in this particular realm, I think the upside is pretty strong. AC: You were speaking before about how people are more interested in the cause than the organization from this data. Do you think this will affect the way nonprofits brand themselves? JC: Well, in some ways, I hope it does change the way nonprofits reach out, because I think if you talk to the vast, vast, vast majority of nonprofits, they’re not having the impact or the reach that they’d like to have. And so I think the idea that they can come together, perhaps even with other organizations, around causes…it’s almost like, you know, all boats rise in a high tide, and that is…if the cause itself becomes something that more and more people get engaged in, it should be good for all those nonprofits that jump in and make that part of their focus. AC: Do you have any advice for those nonprofits struggling with their budgets, who might not have much revenue for technology, but keep hearing constantly that they have to be on social media and get on mobile? What should organizations do when they don’t have the money or staff to do all this social media outreach? JC: I do think one of the really exciting trends we’ve seen is the democratization of philanthropy. It has enabled vast audiences and individuals to get engaged and almost become ambassadors on behalf of causes and organizations. And what we’ve been recommending to nonprofits and helping to train them on for some number of years is how to build supporters into ambassadors in social media. So, I think it no longer requires just the budget of the nonprofit or the workforce of the nonprofit to spread the word. One really effective social media person at an organization can leverage literally thousands of people on their behalf, if done right. And, again, going back to the mobile phone thing…you know, with mobile phones, and then designing properly for mobile phones so you’re optimizing for the platform, it’s another opportunity where you can leverage great numbers with a little bit of effort. AC: Are there any specific mobile strategies that you came across in the research that should be used as a model by nonprofits? JC: Oh, yeah, absolutely. Some of the things I recall are that visual is really important, and optimizing for the platform. What we mean when we say that, of course, is not just taking your website and making it work on a mobile phone, but totally reinventing the way you tell your story and present your cause in that environment. And, because it’s mobile, it’s a smaller screen, so less is more. Being clear about how to get engagement right on the front screen is something that a lot of folks wanted to see, and it’s less about the organization and more about the impact that they’re having. Those were some very clear takeaways from some of the mobile observations. AC: So, as social media engagement becomes increasingly important, how can smaller organizations that are trying to tap into their own grassroots community work with that without losing their own communities? JC: I don’t know if you followed our own work in terms of social media and nonprofits, but for a number of years we’ve actually been engaged in trying some different things, introducing some different platform opportunities, etc. But a big part of that was actually training nonprofits—in many cases, small nonprofits—and a lot of people were afraid that if social media was catching on, that the big brands, if you will, would come in and take over. But, in fact, if you look at what’s happened in social media—and this is true of some of our working campaigns; we did two different annual campaigns called America’s Giving Challenge, and in that, we enabled citizens to champion for causes that they cared about, and it was some of the earliest work done, and then we published the results. And one of the most exciting things about that was that it was small, unheard-of organizations that came to the top quickly, and then, in most cases, held the top spots in those competitions. It wasn’t the brands that everybody knows. Part of the reason for that was they were able to articulate very clearly the impact that they were having—you know, why their cause uniquely represented a great opportunity for giving or for engagement—and they had really strong ambassadors, that concept that I talked about earlier, where they used some of their supporters to go on and strongly advocate for their organizations. So, in fact, I really think social media levels the playing field. I think it gives small nonprofits opportunities they never had before to compete with the big marketing dollars of the big brand names and nonprofits. JC: Storytelling is a big deal. A lot of nonprofits don’t necessarily get that right, but I think making it authentic, making it personal, visual, was something you probably saw that jumped off the page a bunch of times. You know, really using pictures; when you think about storytelling, photographs are storytelling, too, and videos are storytelling, and I think encouraging nonprofits to use more of those tools in their own storytelling is something that will lead to more engagement. JC: So it’s more shareability, right? When you think about the things you share, and we’ve seen this on Twitter, we’ve seen this on Facebook, when a picture is attached, the degree of sharing goes up by a huge multiple. A picture or a video. And the same is true in the nonprofit space. AC: We actually had an article recently about nonprofit storytelling and how people don’t really combine it with the power of measurement, and how we need to merge those more for fundraising. JC: You know, it’s interesting, because I’m a trustee at the National Geographic Society, and essentially, if you talk to the society, they pretty much have just used storytelling to advance their mission for 125 years. Now, that storytelling used to take place mainly through a printed magazine, but now the digital opportunities are just unbelievable. But the whole idea is words and pictures to basically bring people to action around causes that they care about. AC: And, then, of course, the text has to be as short and sweet as possible to really get the attention of the Millennials. AC: Do you still think email is as important as ever? JC: I do. I think that was the other really surprising thing for me, to see that email still plays such a strong role with Millennials. I think the key there is getting the frequency right, because the one negative that I think we saw jump off the page in the report is that being too frequent in the emailing from a nonprofit organization becomes an irritant to Millennials. So, they still…many of them still receive, I forget the number, I think it was the majority, I don’t know…We didn’t think they were using email. But they don’t want it too frequently. But back to the issue of innovative engagement. Do you know the organization KaBOOM!, which provides playgrounds? Basically, they’ve used social media to determine where playgrounds will go next, and then to build community support and engagement with the playground itself, so engagement is truly the driving direction for that organization. Darell [Hammond, founder of KaBOOM!] is just a really strong, innovative leader. AC: That’s getting at my question earlier about, you know, how you can engage your geographic community mixing in social media. JC: And easily done on a mobile phone, right? So, similarly, the Case Foundation has invested in three giving platforms. We’ve invested about $4 million in those giving platforms to date, but combined they have contributed over a billion dollars in microdonations to nonprofit organizations. AC: And what are those giving platforms? JC: Causes on Facebook, Network for Good, and MissionFish on eBay, which allowed the merchants to contribute a portion of the sale to a cause they cared about. JC: Well, you know, I’d have to say one thing we’ve always talked about is the future promise of what we call “everyday philanthropy.” I think Millennials will drive this, because I think it’s what they’ll demand. AC: Jean, thank you so much for the interview. This has been a real pleasure. JC: And thank you! It was great to be interviewed by a Millennial about this topic.